Did you take the “momo challenge”? Did you see the hacker, a woman with bulging eyes and superior facelift who sneaks into your WhatsApp account and demands children do dangerous “challenges”, like self-harming and other violent stuff? If you did, you’re the only person on planet Earth who did. 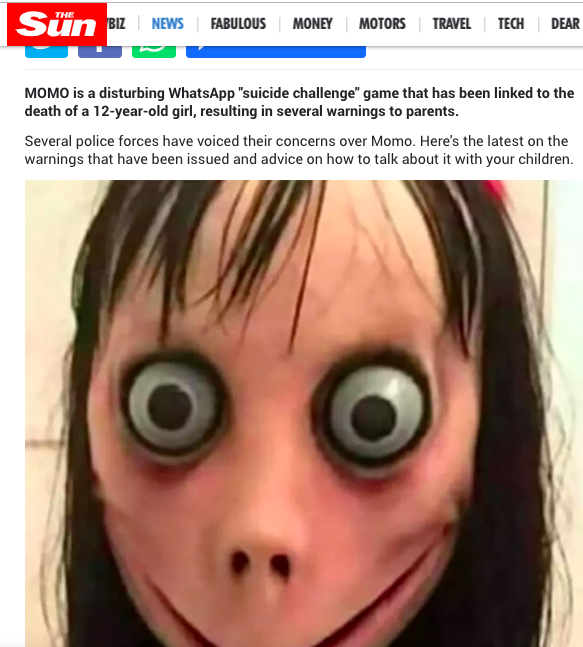 “News coverage of the momo challenge is prompting schools or the police to warn about the supposed risks posed by the momo challenge, which has in turn produced more news stories warning about the challenge,” says Jim Waterson. Momo is not a real person. It’s just a photo created by a Japanese special-effects company called Link Factory a few years ago. Hundreds of separate articles have been written on the topic by British news websites in the last three days, dominating the most-read lists on tabloid news sites…. Celebrities such as Stacey Solomon have weighed in and expressed their concerns, creating even more justifications for headlines. It’s a moral panic! Like video nasties and the Gorbals Vampire. “Four weeks ago I was called into his school because he’d said to two children he was going to “stab them” – I was devastated and it’s been dealt with accordingly. (Bare in mind he turned five in January!). He’s been wetting the bed & he’s been coming into my bedroom early hours because of scary dreams! I am absolutely gutted, I honestly thought my children were quite sheltered. This freak scares me let alone my kids. Mummy. What’s a c***? I saw it on the Internet. 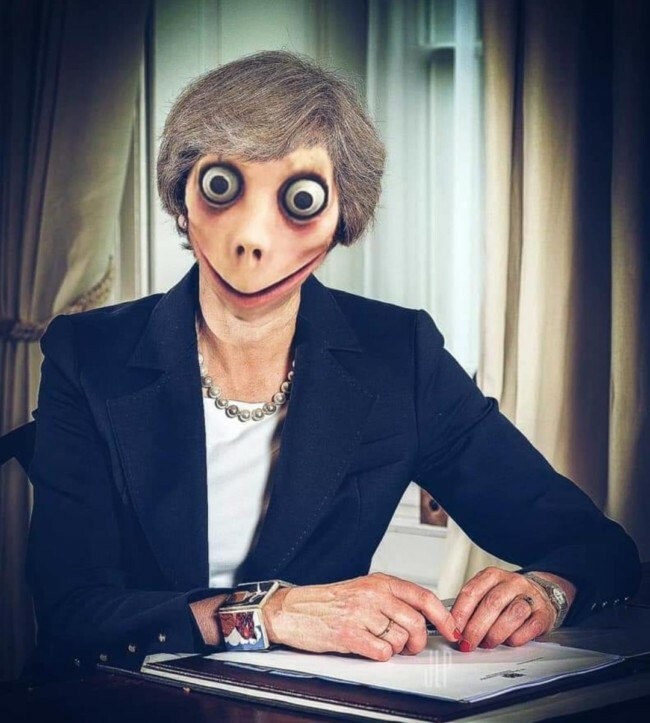 They says the real Momo voted for Brexit.